Expand Waiqar's army wih the Lord Vorun’thul Hero Expansion for Runewars Miniatures Game! A once noble and stalwart knight, by pledging himself to Waiqar the undying Lord Vorun’thul transformed into a fearsome vampire. 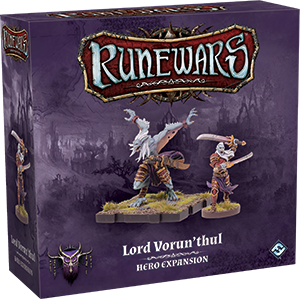 Witht his duality, Lord Vorun’thul is the first Runewars Miniatures Game character to transform mid-battle, alternating between his humanoid form, and the terrifying Vorun’thul the Cursed. This means that Lord Vorun’thul enters battles with two different unit cards and will swap between both figures and unit cards as the battle progresses, always using the same command dial. Lord Vorun'thul is versatile and fearsome, and your opponents will never know what to expect from the once-honorable knight!